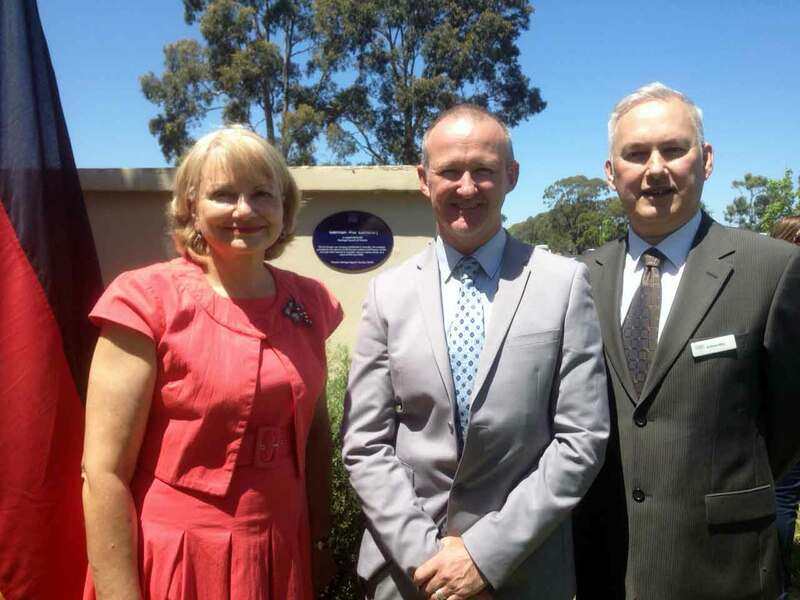 Today attended the Memorial Service (Volkstrauertag) at Tatura War Cemetery, and spoke on behalf of the Heritage Council of Victoria in officially recognising the state listing of the cemetery in the Victorian Heritage Register and the unveiling of a blue plaque. It was a beautiful ceremony with the Templer Choir and brass ensemble’s renditions of ‘Abide with me”, Friedrich Silcher’s Sanctus, and ‘Ich bete an die Macht der Liebe’. On the morning after the terrorist attacks in Paris, words from Josef Reichhardt (Chargé d’affairs, Embassy of the Federal Republic of Germany), Claudia Ostarek (Evangelical Church Germany) and Pastor Christoph Dielmann (Trinity Church Melbourne) spoke with compassion of the histories, memories and contemporary challenges of man’s inhumanity to man. (LtoR): The Hon Dr Sharman Stone MP (Federal Member for Murray), Mr Tim Smith (Executive Director, Heritage Victoria), Professor Andrew May (Historian Member, Heritage Council of Victoria). This was the first foreign war cemetery established in Australia and is the only German War Cemetery in Australia. The Cemetery shares a close relationship with the large group of local Tatura World War II internment camps, of which little physical fabric remained (the Dhurringile Mansion, Camps 1, 2, 3, 4, and 13 and an associated wood cutting camp at Graytown). The stories of these camps are also maintained through the work of the local historical society and presented at the Museum in Tatura. Established after World War II on land excised from the Tatura Cemetery, the cemetery provided for the burial of German internees and prisoners of war who died while detained in Australia during World War I and II. The first section of the war cemetery was opened in November 1958 by the West German Ambassador, Dr Hans Muhlenfeld, for World War II civilians and prisoners of war who died while imprisoned in Australia. A second larger section was opened in 1961 for the reburial of German World War I internees.